Thirsty Pilgrim: Here's to Fried Potatoes. Today I will do something that blogs are very good at: share a small piece of genius. So I was listening to the Brewing Network the other day — a raucous, vaguely profane and highly educational radio show/podcast that is mostly about homebrewing — and the guest was beer writer Jay Brooks. He of the Brookston Beer Bulletin. Anyway, it came out during the discussion that Mr. Brooks has a frite fetish. And rather discretely he maintains a blog about it on the side. So I checked it out. And it's really good. Nothing but acres of fried, salted potato. Beautiful. Needs a bit more geographical breadth, maybe, but the blog is positively appetizing. 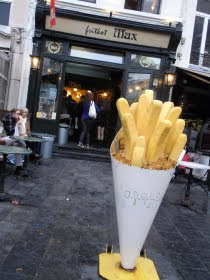 One project I have meant to do for a long time is to investigate, evaluate and document the best frites in Belgium according to me. But it would be a lifetime project — far more daunting than beer. Some things are truly priceless, and roadside frites with mayonnaise is one of them. Perhaps I should have just moved to a different European country instead of across the pond? I don't know, man. Plenty of fried potato of all shapes and sizes in Americaland. The Belgians do add a certain style and technique, but quality varies everywhere. I think if the key elements of fried potato and salt are present, it's hard to go wrong. Mrs Velky Al does these fantastic sliced potatoes fried with gyros spice which are fantastic! But generally you are right, the fried potato was worth the discovery of the New World in and of itself.